The holding company's advertising business grew by 4 percent in the quarter. Omnicom Group reported a 2.9 percent jump in organic revenue to $3.7 billion for the third quarter of 2018, year-over-year, beating analyst expectations. Revenue was down, however, on a non-organic basis in Q3 by 0.1 percent. The group’s operating profit increased 6.8 percent to $502.3 million this period, compared to last, and net income increased 13.4 percent to $298.9 million. 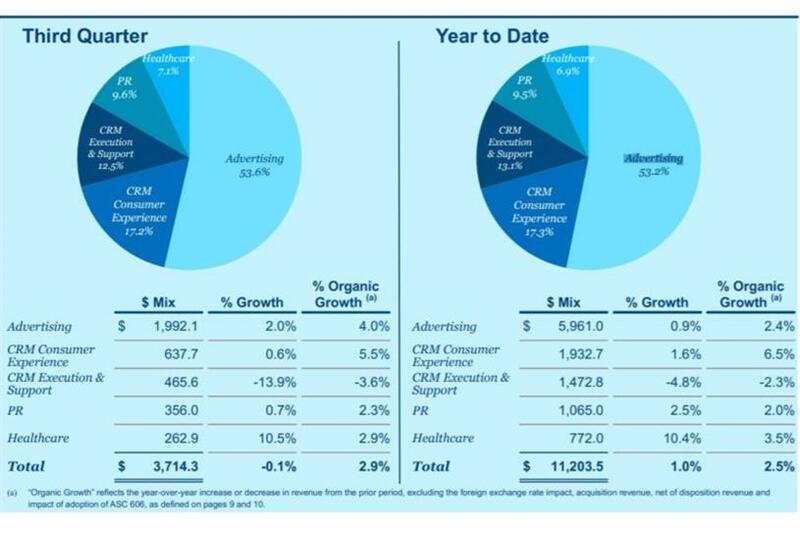 Omnicom advertising business grew organically in Q3 by 4 percent to $1.9 million, with CRM consumer experience up 5.5 percent, PR up 2.3 percent and healthcare up 2.9 percent. CRM execution and support decreased 3.6 percent in the period. Regionally, Omnicom saw the most organic growth in Asia Pacific in Q3, which was up 13.6 percent, year-over-year, followed by Euro markets and other Europe (6.9 percent); Latin America (1.7 percent); and nearly flat growth of about 0.6 percent for the U.S. Other North America markets saw a decrease of 5.4 percent, with the U.K. down 0.3 percent and the Middle East and Africa down 0.4 percent. Omnicom cut about 8,400 positions worldwide this past quarter as it sold 19 businesses in an effort to push digital advertising forward, according to Reuters.